Anyway, this month we made our way over to Caffe Niche, where we got to check out the work of SLC artist Gia Throndsen-Whitlock hanging on the walls of the upscale diner. We chat with her about her artwork and thoughts on the local scene, and you can check out her entire display in this gallery here. Gavin: Hey, Gia. First thing, tell us a bit about yourself. 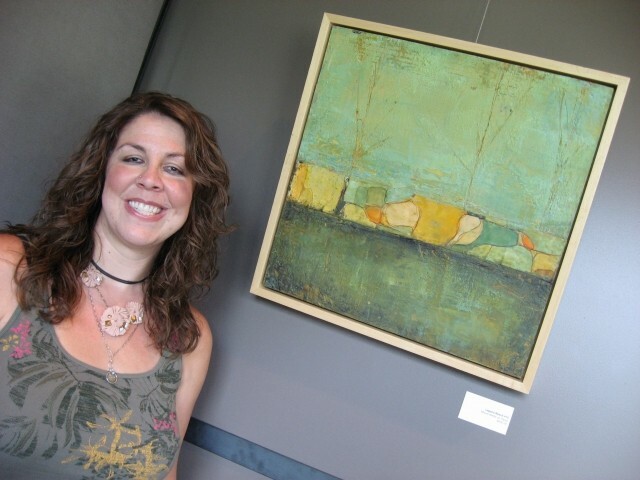 Gia: I am a native of Utah, graduated from Westminster College in 2002, and have spent the last 10 years working on art and graphic design. I've also had two children, who are 3-years-old and 7-months-old, girl and boy, respectively. I currently live and work in Sugar House. Gia: My mother was a career artist. She worked in the computer-art industry ever since I was 9 and she painted in oils on the side. She was immersed in art all of her life, and she dragged, or brought, me in with her. Gavin: As mentioned, you attended Westminster College and received a degree in art and communications. What made you choose Westminster, and what was its program like for you? Gia: Once again, it was my parents who led me to Westminster; they liked the small class sizes. So, I went there and, it's safe to say, had the time of my life. As far as their program, Westminster had a little bit of everything. I took a variety of classes, from traditional oil painting and printmaking to computer art and photography. Gavin: During that time, what drew you toward mixed media works, and how was it for you experimenting with the genre prior to your professional career? Gia: Out of all the bits of art experience I had, I loved painting and I developed an obsession with different kinds of paper. I was nervous to try mixing media and just admired the work of others for a long time. 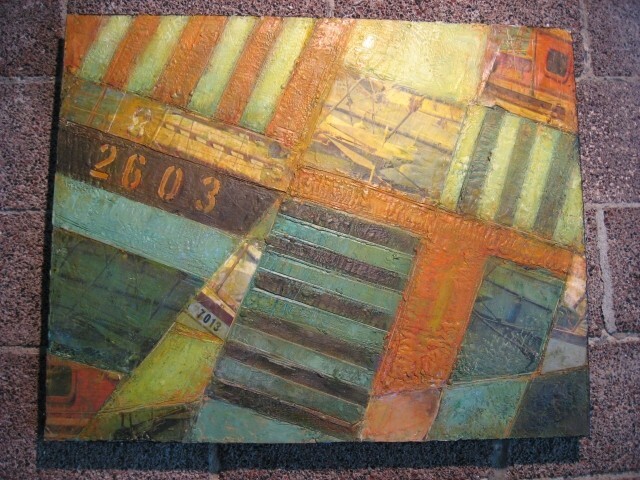 I worked in oils until 2009, when I finally gave in to my urge and started using collaged backgrounds in acrylic paintings. I so fell in love with the many textures and variations I could get with paper and paint that I couldn't stop myself after that. 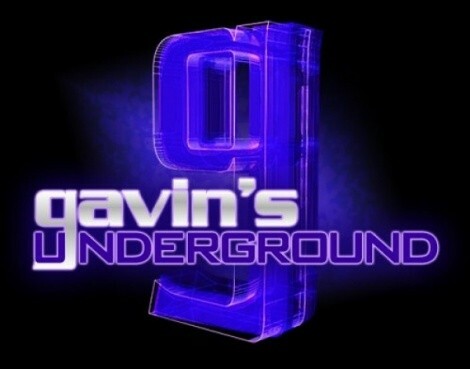 Gavin: Right out of college, you started working as a graphic designer. What was it like for you entering that line of work while still creating your own pieces on the side? Gia: I don't really know where my first four years in the workforce went. I spent a lot of time in the gym after work, so art wasn't really on my schedule until 2006. My mother had been diagnosed with terminal cancer, so she quit her art job and built a studio above her garage so she could paint. Soon after that was built, we started painting still lifes together on the weekends. Gavin: After about five years, you took time off to start a family. What made you decide to take the time off, how was your time raising your kid and what persuaded you to go back to doing art? Gia: My mother's illness made me see things differently. I realized I wanted kids and, at about the same time, the company I worked for sold off half of the business. Therefore, my job changed from full-time, in-office to part-time, work from home. I saw this as an opportune time to start my family while working in this way. When my daughter was born in 2009, I decided to focus on her and art instead of trying to do it all. Gavin: When you came back, you opened your own studio in the heart of Sugar House. Why open your own studio, rather than find a workspace at home or join a collective? Gia: Actually, I did find a workspace at home. As my family has grown to its perfect little size, I've worked in the garage, the basement, out on the back porch and, for now, I have settled in a bedroom upstairs. Gavin: Having been gone for a while, what was it like for you getting back into the fold and showcasing your art around the city? Gia: It was actually quite exhilarating. I did a show at Caffe Niche in 2010, which led to 15th Street Gallery, which led to Art & Soup, which lead to Alpine Art and so forth. Since that show back in 2010, I've sought and been presented with opportunities to display work, and I've been very grateful for the exposure. Gavin: What's the process like for you when creating a new piece, from original concept to the final product? Gia: The process is highly intuitive. For example, the piece I am working on right now came from my walk through Sugar House with the kids and the dog last week. I saw the old Salt Lake Costume Company sign and loved the colors, so I memorized them, went home and got some papers together in those hues and am working on a finished product. Gavin: Considering the format, do you play around with your designs a lot or do you try to stick to the original idea? Gia: I do play around with my designs a lot until I like what I see. In the beginning, the concepts start with colors and shapes in no particular order. After some time arranging and rearranging the elements, I snap a picture with my phone or the iPad and try to stick to it from there. Gavin: Seeing how your work incorporates a lot of different styles, what do you prefer to work with the most in your art, and what kind of a challenge is it for you to master a form that really has no boundaries? Gia: I have become fixated on paper and paint. I see myself sticking with that for a very long time. The possibilities are, indeed, endless, so the challenge for me is keeping up with new techniques associated with the various media that I incorporate, along with striving to keep my work consistent, yet fresh and interesting. Gia: I actually have two types of work out right now. 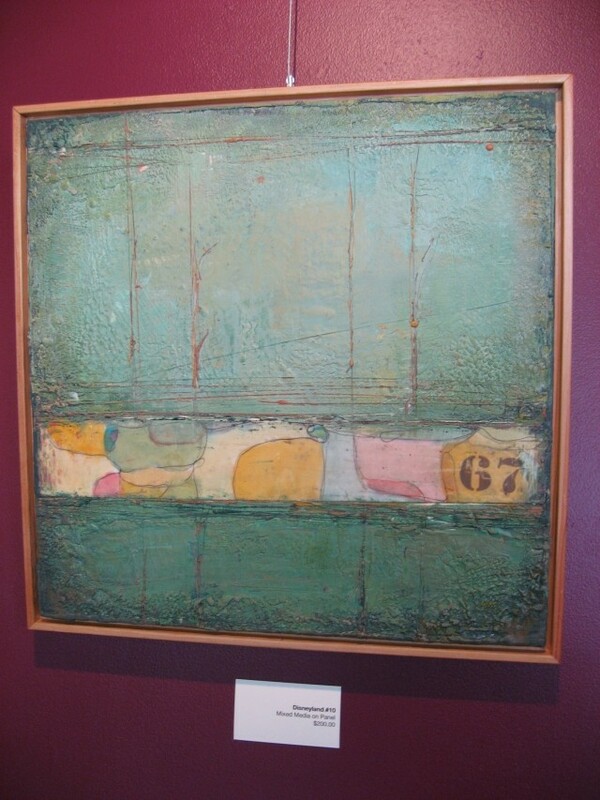 At Caffe Niche, I've hung my encaustics from 2010. 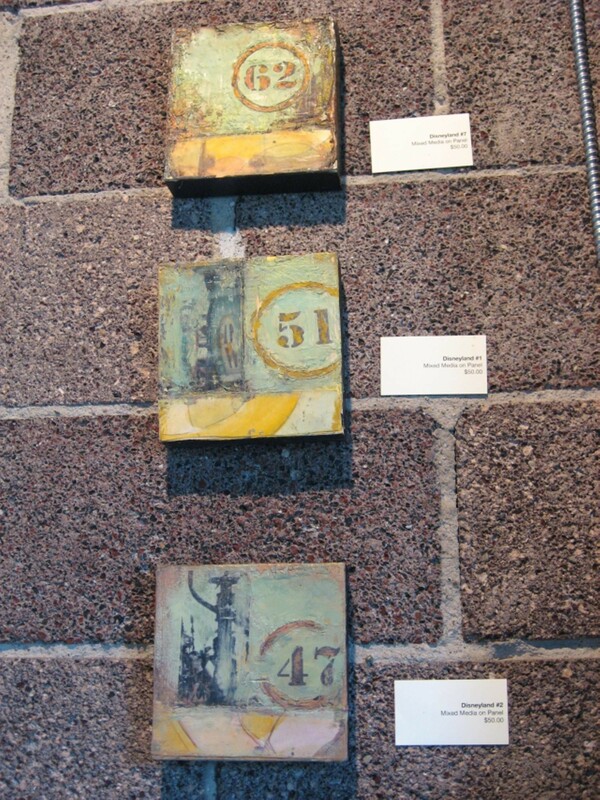 Those are mostly larger pieces that I had based on a three-layer landscape format. By this, I mean foreground, middle ground and background. 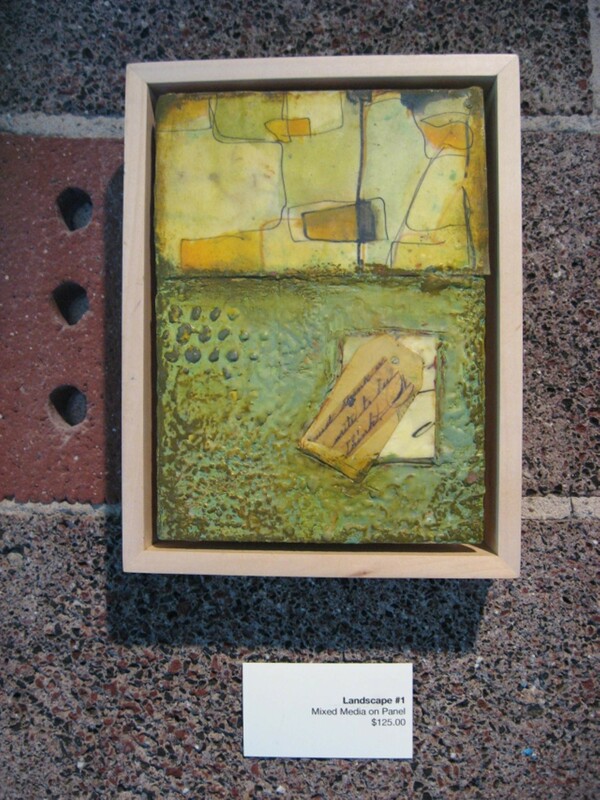 Also, 15th Street Gallery is currently showing my newest mixed-media work. 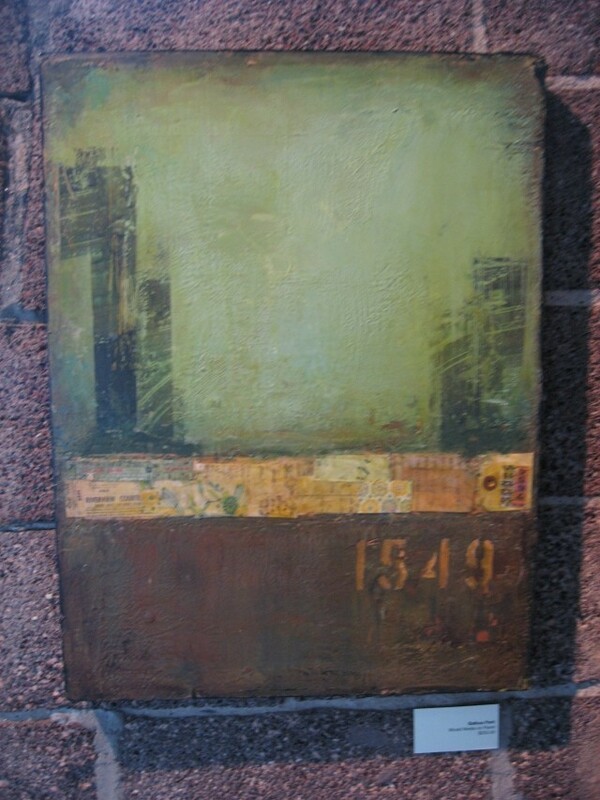 These collages are much more loosely based on land and cityscapes. 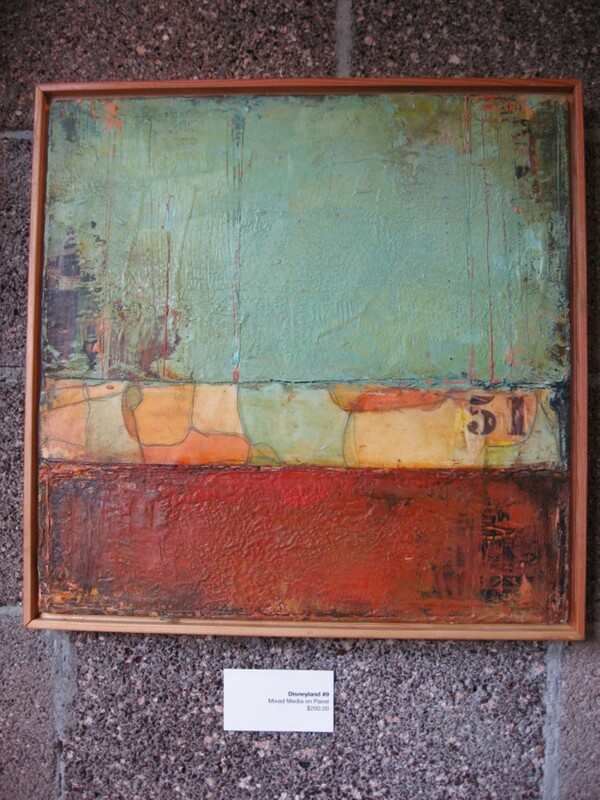 Gavin: What are your thoughts on being displayed at Caffe Niche and working with them in a non-traditional setting? 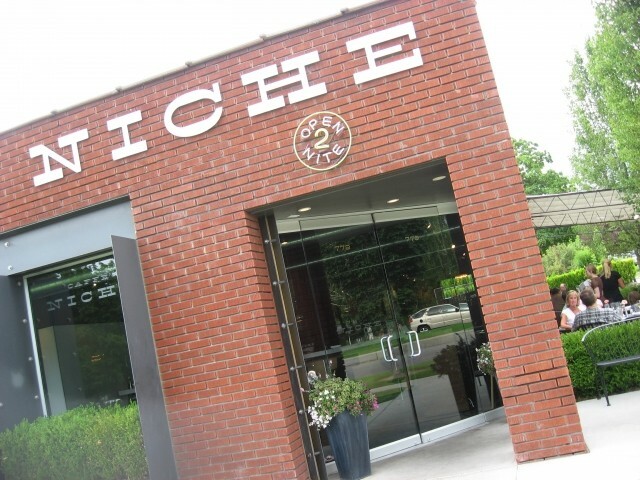 Gia: I have enjoyed three shows with Caffe Niche and they have always been great to work with. People always say, "Restaurants aren't as desirable as galleries" for showing your artwork. But, my sales have always been really good at Niche, sometimes even better than at festivals or galleries. Gia: Salt Lake City has quite a few wonderful artists and I look forward to seeing their work around town. I am flattered to show with some of these talented individuals. However, I sometimes wonder how hard it is to make a living selling abstracts in Utah, where landscapes seem to be the most popular genre. Gia: I think over time, as the city changes and becomes even more diverse, the art scene will blossom along with that. 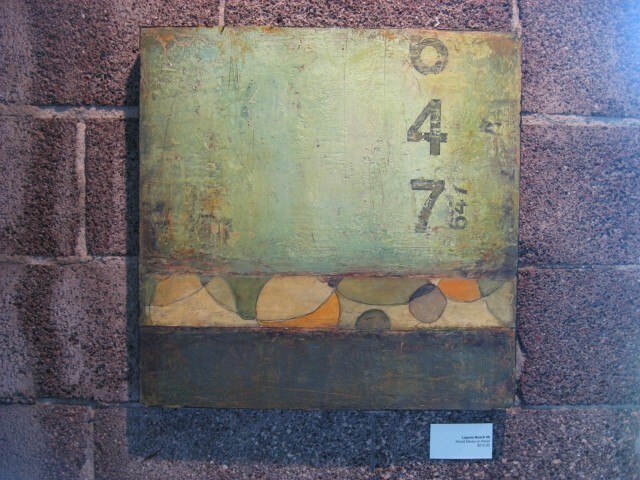 Gia: I like to go out, have a glass of wine and see new work from Utah's established and emerging artists. Galleries do a great job of welcoming so many people in to see the work and socialize. 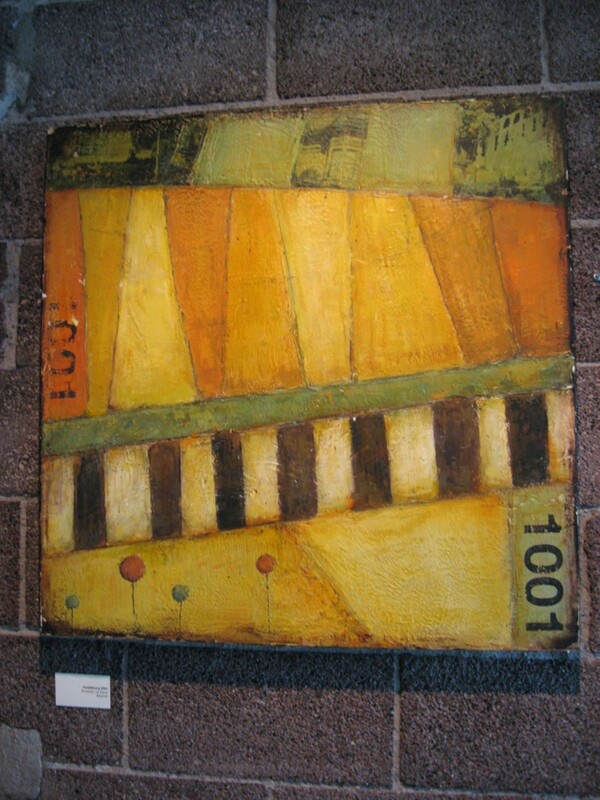 My hope is to make it to more of the galleries around town, but I usually do only one per stroll. 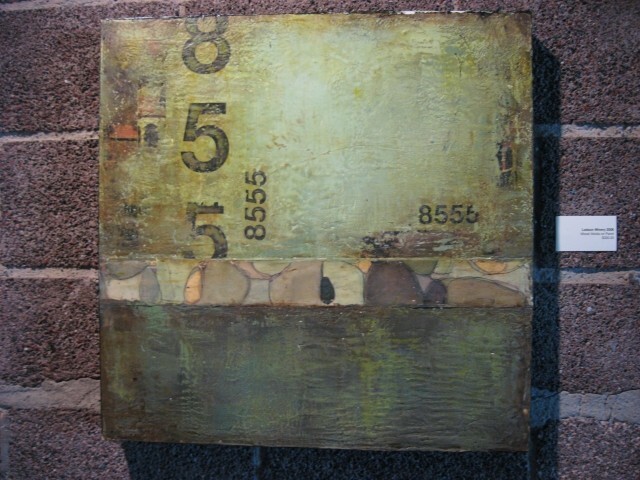 Gia: In August, I will have some mixed-media pieces available at Taste Of The Wasatch as part of their silent auction. In September, I am doing a collaborative project with The Sharing Place, a grief-support center for children. I will be at their Colors Of Life fundraiser, creating a large art piece with event guests who contribute a piece of artwork. I get the unique pleasure of weaving these elements together to create a final piece that will hang at The Sharing Place. Gia: Well, I have a bunch of online addresses to plug, such as my prints on ArtistRising.com, my blog and website.